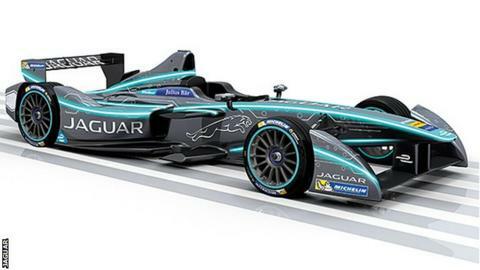 Jaguar will return to motorsport in 2016 after 12 years away when they enter a team in electric racing series Formula E.
The Indian-owed manufacturer will replace the outgoing Trulli team for the 2016-17 season. Formula E is currently in its second year, with Nelson Piquet Jr having won the inaugural 2014-15 championship. Jaguar have not been involved in top-level motorsport since leaving Formula 1 at the end of 2004. They are joined by Williams Advanced Racing as official technical partners, part of the group which includes the Williams Formula 1 team. "Electric vehicles will absolutely play a role in Jaguar Land Rover's future product portfolio and Formula E will give us a unique opportunity to further our development of electrification technologies," said Nick Rogers, JLR's Group engineering director. Indian conglomerate Tata bought the British-based Jaguar and Land Rover brands in 2008 from Ford, who had previously raced the Jaguar brand in F1 from 2000 to 2004. After a failing to win a race, the team was sold to Red Bull, who went on to win four Formula 1 constructors' and drivers' championships in successive years.